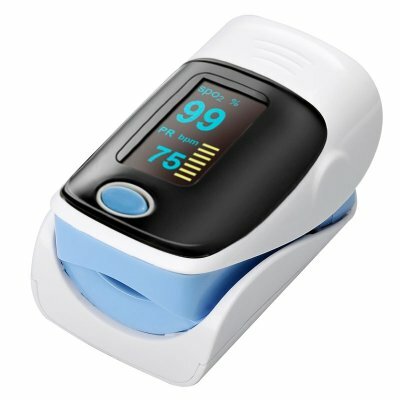 Successfully Added Fingertip Pulse Oximeter - 1.2 Inch OLED Display, Auto Power off, Low Voltage Display to your Shopping Cart. It’s not just those suffering from medical ailments and their care givers that find pulse oximeters valuable, for a number of years mountaineers and athletes have also taken advantage of the portability pulse oximeters offer. This allows these people to monitor oxygen levels at higher altitudes or after strenuous exercise without being weighed down by heavy equipment. It can be a valuable tool for them when determining if supplemental oxygen may be required and has life saving implications in all sorts of environments. With a 1.2 Inch OLED display you can easily see the readings in one of 4 different ways all through the touch of a button and right there at your fingertips. You can use the pulse oximeter for about 48 hours on two AAA batteries and the auto power off function ensures that it will no run down your batteries when not in use. This product is in stock now, we offer a 12 months warranty on all our products. Brought to you by the leader in electronic devices as well as wholesale medical gadgets, Chinavasion.. Very fast shipping, good product, I'm just trying it, so far so good, and I communicate twice and very good attention.